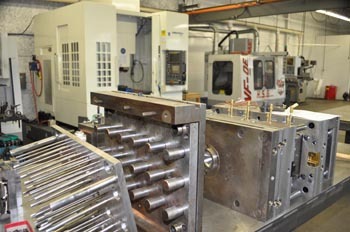 Our modern fully-equipped, in-house mold shop ensures fast response on your tooling needs. We are capable of producing both Prototype and Production tools with minimal lead times. Our team is staffed with highly skilled and experienced mold makers, and our facility is equipped with the latest machinery. In-house resources give us direct mold build control, rapid maintenance, refurbishment, and revision capability. We have developed a strong relationship with an Asian mold builder to offer our customers a lower cost offshore tooling option. Not all parts are good candidates for Asian sourcing, but for the right project this can be a cost effective option. The option of in-house or off-shore mold building allow us to price our molds on a very competitive basis, both in time and dollars. Copyright ©2019 E & O Tool & Plastics, Inc. - All Rights Reserved.